In collaboration with coworkers in France, Austria and Japan, we have followed the progress of very high frequency sound pulses as they traverse a tiny glass fibre less than 1 micron in diameter. Seeing nano-objects with high frequency sound promises higher imaging resolution than with light because smaller wavelengths can be used. By continuously following the passage of focused high-frequency sound pulses in a sub-micron sized 3D object, a cylindrical glass fibre in this case, we have made an essential step in this direction. We first made very thin fibres by stretching heated silica optical fibres. After coating them with a thin film of aluminium, we launch acoustic pulses from the side using ultrashort light pulses. 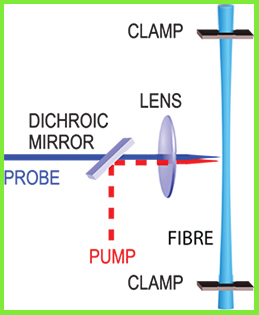 High-frequency sound pulses are optically generated on one side of section of thin fibre, and are monitored with picosecond probe pulses as they bounce backwards and forwards inside the fibre. 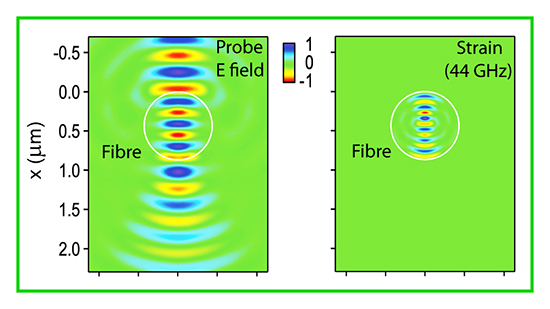 After the sound pulses are generated at the fibre surface, they are focused to the centre of the fibre to a tiny 100-nm-width spot, and then diverge, hitting the opposite side of the fibre before bouncing back again. We follow this process using optical probe pulses that penetrate into the glass and allow the sound pulses to be monitored as they travel in the glass. Simulations of infra-red light (left-hand image) of wavelength 800 nm and sound (right-hand image) of wavelength 136 nm in a 400 nm radius silica fibre used in the experiment. The experiment is an extension of the technique of picosecond ultrasonics, a way to probe thin films and nano-objects with sub-picosecond duration light pulses. In future, this technique, combined with the methods of computed tomography (CT), should allow images inside transparent or opaque nanoscale objects with better than 100 nm spatial resolution to be obtained, opening up the possibility of 3D ultrasonic imaging of tiny objects analogous to the way medical ultrasonic scans of regions inside the human body are made. 'Optical tracking of picosecond coherent phonon pulse focusing inside a sub-micron object,' T. Dehoux et al., Light Sci. Appl. 5, 16082 (2016).